•Listed for twenty years in Best Lawyers in America, published by Woodward/White and various Chambers listings. •Awarded the Distinguished Alumni Award from the University of Wisconsin-Eau Claire, where he received his B.A. in Economics in 1967. •Appointed by EPA Administrator, Christine Todd Whitman, to EPA’s NACEPT (National Advisory Council for Environmental Policy and Technology) Superfund Subcommittee which is considering Superfund reform. •Served as Chair of Phoenix Environmental Quality Commission. •Appointed by Secretary Tommy Thompson to Board of Scientific Counselors, Agency for Toxic Substances and Disease Registry (ATSDR). •Invited Speaker, Institute of Politics at Harvard University’s John F. Kennedy School of Government. •Member, Arizona State Bar Professionalism Task Force. •Selected as one of Arizona’s Finest Lawyers for 2011. 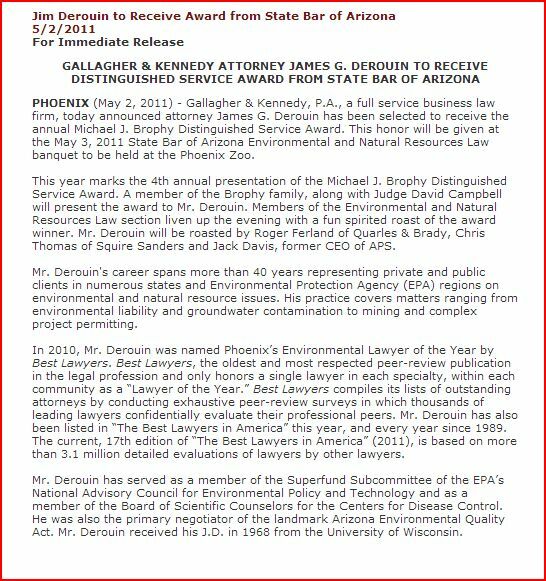 •Named 2011 Phoenix Best Lawyers Environmental Lawyer of the Year. •Recipient of the 2011 Michael J. Brophy Award. 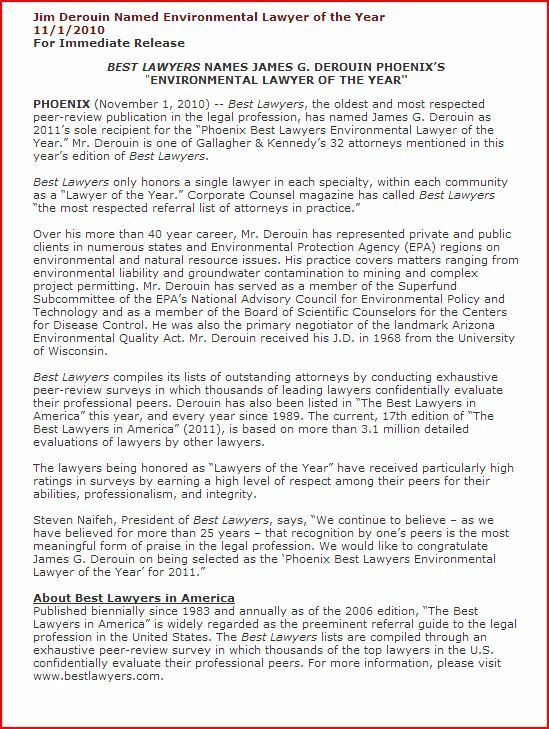 •Selected as being among the world’s pre-eminent Environment Lawyers and listed in The International Who’s Who of Environmental Lawyers 2011 and 2012. •Included in the 2011 Inaugural Selection of America’s Most Honored Professionals.